Moving home is considered one of the most stressful things you can do during your life, after all it is a life changing event. Care Move have been providing home removals West Midlands for families specifically, Birmingham, Sutton Coldfield, Solihull and beyond for generations and are here to make it a smooth transition for you. By choosing Care Move to carry out your house removals you can ensure that everything will go according to plan. We understand every move is different, our tailored services will help ensure everything goes according to plan. We cover the entire Birmingham, Sutton Coldfield and Solihull area. We pride ourselves on our strong reputation for delivering reliable, professional removal services throughout Birmingham, Sutton Coldfield and Solihull. When time is of the essence we have a packaging service. Our removal consultant will carefully package and wrap your possessions to ensure a safe transit. Boxes, labels, bags, ties, tissue paper, containers and hanging wardrobes are available for every move. We have fully trained staff who will move all your valued possessions with the utmost care. 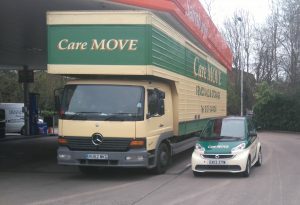 Care Move also provide containers for storage and offer free insurance cover for all domestic removals. We can help provide as much or as little a service as you require, including a full or part packing service a couple of days before your move. We ask you to pack your own personal items yet we can deal with rest of it. We provide free packaging materials 2 weeks before your move which includes packing cases, rolls of tape, printed labels, paper and washers for the hose pipes on your washing machine and dishwasher at no extra charge. On the day of the move use of cardboard hanging wardrobes mean that your clothes can be taken direct from your wardrobe hanging rails onto our mobile wardrobes for easy transportation. All our staff are fully trained. We do not use agency staff. On the rare occasion even the most experienced Removal Companies with prepared vehicles are going to be beaten by the weather from time to time making it difficult to reach difficult roads. 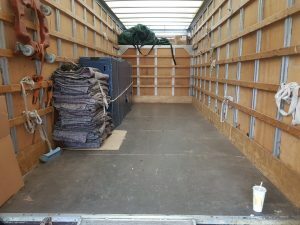 Try to work with your removal company on a back up plan and we will try to accommodate your needs to the best of our ability making sure your move happens. It may be an idea to pack a case in the event of snow and keep warm whilst waiting for key release. It may be useful to negotiate a new removal date or look at storage solutions should your solicitors not release keys in good time. Should we encounter a heavy snow fall throughout the day we may be left with no alternative but to head safely to a warehousing depot.